Wangari Muta Maathai was the founder of the Green Belt Movement of Kenya as well as the first environmentalist and first African woman to win the Nobel Peace Prize (2004). Born in Ihithe, Kenya in 1940, she obtained her B.Sc. (1964) and M.Sc. (1966) in the United States, and then earned her Ph.D. (1971) at the University of Nairobi, the first woman in East and Central Africa to earn a doctorate. Professor Maathai became chair of the Department of Veterinary Anatomy in 1976 and an associate professor in 1977, another first for a woman in the region. From 2002-2007, Professor Maathai represented the Tetu constituency in Kenya’s parliament and served as Assistant Minister for Environment and Natural Resources in Kenya’s ninth parliament from 2003–2007. She was appointed Goodwill Ambassador to the Congo Basin Forest Ecosystem by the eleven Heads of State in the Congo region in 2005. In 2006, she founded the Nobel Women’s Initiative with her sister laureates Jody Williams, Shirin Ebadi, Rigoberta Menchú Tum, Betty Williams, and Mairead Corrigan. In recognition of her deep commitment to the environment, the United Nations (UN) Secretary-General named Professor Maathai a UN Messenger of Peace in December 2009, with a focus on the environment and climate change. Professor Maathai was deeply connected to the land and people of Kenya. Her rural roots informed every action she took on behalf of the Earth and all its inhabitants. She died on September 25th, 2011 from ovarian cancer. Lilian Wanjiru Njehu was a member of Kanyariri Mother’s Union Tree Nursery, the first Green Belt Movement community group to start a tree nursery. Lilian was also a close friend of Wangari’s and was instrumental in keeping her safe during the years when Wangari’s life was in danger. Kamoji Wachiira formerly associate professor at the Kenyatta University, a botanist and ecologist, was a long-time democracy/human rights and environmental activist. Arrested and jailed twice by former President Moi’s regime in June 1982, he was finally imprisoned in July 1982 for three years without trial. Kamoji was adopted as a prisoner of conscience by Amnesty International in 1982 and later named Prisoner of the Month for July 1983. Granted asylum in Canada in late 1988, he now lives and works there – as well as continuing to advocate for environmental conservation and democratic reforms in both Kenya and Africa. Vertistine Mbaya was a Green Belt Movement founding board member and a long-time friend and colleague of Wangari Maathai’s at the University of Nairobi. 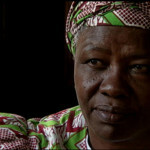 Ngorongo Makanga was a pharmacist by trade, a member of the pro-democracy movement, and a cofounder, with Wangari Maathai, of the Green Party in Kenya. 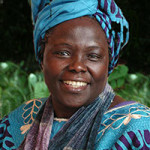 Human rights activist, member of the pro-democracy movement and co-founder with Wangari Maathai of the Green Party in Kenya.